During the investigation in the case of a mysterious bomb attack on a bureau building in Dallas, FBI agents Mulder and Scully are being dragged into the most dangerous conspiracy of their careers. 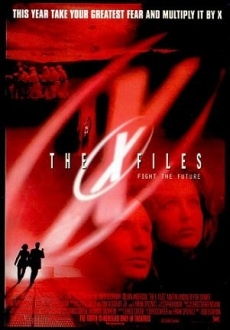 With the doubtful help of a paranoid scientist, Mulder and Scully risk their lives to destroy a deadly virus from alien origin which could destroy all life on the earth. 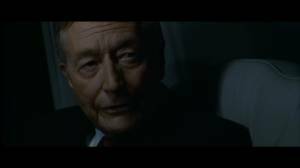 The search for the truth makes Mulder and Scully confront with a ruthless syndicate of powerful wirepullers who do their utmost to keep their secret forever. 1 cut = 41 sec. 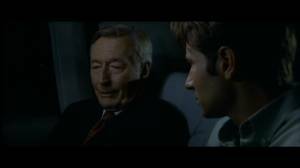 The Well-Manicured-Man tells Mulder there was only one reason his father gave away his sister Samantha. She was supposed to be made an alien-human-hybrid to survive the virus' holocaust. The WMM explains his group cooperated with the alien colonists and therefore, made programmes, like the one they've seen before, possible. To get access to to the virus, hoping to be able to create a vaccine behind their backs. 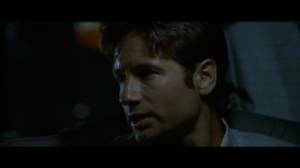 Mulder replies they did it to save their own butts. The WMM says that survival was the ultimate strategy but that his father was smart not to believe that. 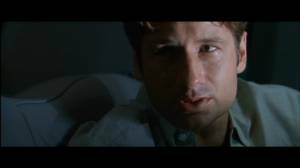 Mulder counters that he had sacrificed his sister, had her be abducted. But the WMM denies that. He explains that without a vaccine, only people who are immune were able to survive the virus-holocaust: clones between humans and aliens. So he had it "allowed" for his daughter to be abducted, so she would be incorporated into a clone programme, for one reason. 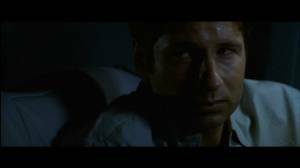 Mulder finishes this thought: For her to survive as a genetic hybrid. 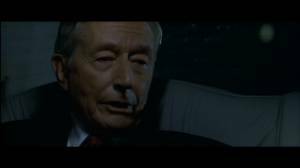 The WMM continues: Moulder's father chose hope over selfishness, hope was his only future. It was his hope for them to find out about this project's truth and that they would stop it - that they fought the future.